Last Thursday, during our regular club session, we received the terribly sad news that our dear friend and chess enthusiast Rudy Thorwirth passed away. Rudy had a lot of energy and was quite active, with several interests that included chess, tennis, dancing, piano playing, stocks and bonds, the internet, long walks . . . and probably lots more that we don't realize . . . . . not bad for an 82-year old who died doing perhaps one of his favorite things, walking around the Lafayette Reservoir (on May 21, 2012). I understand Rudy was alone and had a heart attack during his walk, and that he never regained consciousness. Rudy will be remembered by many in the chess club for his enthusiasm for the game, and for his friendship that he extended immediately with such good humor and gentleness with everyone he would meet. 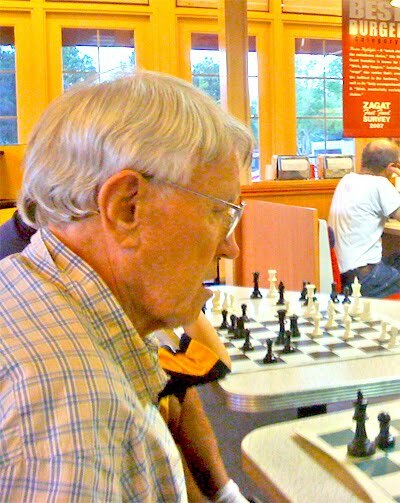 Along with John S., Stewart, and Hossam, Rudy helped establish the Contra Costa Chess Club as a going concern when it was still quite new as a USCF affiliate club at its Starbucks venue. He will be dearly missed, that is for certain. Thank you to John S. for providing the picture of Rudy.